A little bit late I know, but they do say it’s fashionable to be late to the party, so in that spirit, here’s to a fantastic 2012 and let’s hope it continues to bring good fortune to fine rums and everyone who enjoys the pirate spirit. From what I saw and heard last year, the Rum category had a great year, with more brand awareness, the introduction of many great new rums to the UK (including but not limited to: Banks 5 Island Rum; Chairman’s Reserve The Forgotten Casks; Plantation Guatemala Gran Añejo; Plantation Single Cask Limited Edition Rums; Ron de Jeremy and St Lucia Distilleries 1931) and a continued rise in the number of rum clubs and rum tastings. Although I have no statistics to back up the aforementioned claims, I would say that the sheer number of people attending RumFest 2011 could be taken as testament enough proof, as it was certainly busier than the year before, as I have been led to believe it has been each year before it. 2011 was also an interesting year for me, with my first true explorations of the appreciation of this much misunderstood category of spirit. Not only did I gain more knowledge about the history of rum, the Caribbean and the impact that sugar cane production had on the world at large, but in attending the shows, tastings and rum clubs I had the pleasure of making new friends and meeting lots of interesting and fun people. I can only hope that 2012 allows me to continue expanding my knowledge and allowing me to share it with you, my readers. Talking of London’s Rum Clubs, Trailer Happiness kicked of the New Year with the London Rum Club playing host to Banks Rum on the 9th January. More details will be in a soon to be released post, but suffice to say the night was a great success and if the rest of this year’s London Rum Clubs are anything like this one, then it should be a great year to come. Floridita’s Rare Rum Club has also announced its first event of the year, which is due to take place on the 23rd February, although no specific rum has been stated, it should be an evening well worth the visit. And working on the principle that three’s a charm, even Cottons Rhum Shack has thrown its stirrer into the mix, announcing their intention of adding a Cottons new Rum Club to their 2012 agenda. This weekend has also seen the start of Selfridges Rum Week, in their London store, following in the footsteps of similar events in their Birmingham and Manchester stores, thios past week gone. Offering shoppers the chance to “Get warm in the winter with Rum at Selfridges London”, every day sees a series of tasting workshops in the ground floor Wine Shop. Please see the Selfridges website for further details. Also kicking off this week is the first of a number of Master Classes at The Grosvenor Hotel’s Réunion Bar. First up will be Santa Teresa’s brand ambassador Jim Wrigley who will be taking guests through a discovery of rum and chocolate. A week later, Stefanie Holt and Paul McFadyen, the respective brand ambassadors for El Dorado and Plantation Rum’s will combine forces to combat seafaring ne’er do wells to talk about their great rums. While there are currently no further Rum Master Classes lined up at the moment, this is a great start and may be an indication of a bar for rum lovers to keep an unpatched eye on. All in all, I think 2012 is shaping up to be a great year, now let’s just see if I can also pull my finger out and get on with all those rum reviews that I keep promising myself that I’ll write, as well as playing catch up with a couple of the round-ups from last year. I’d also like to take this opportunity to thank everyone who’s helped me out in the past year but also to you, the readers who keep coming back and have given me such positive feedback. 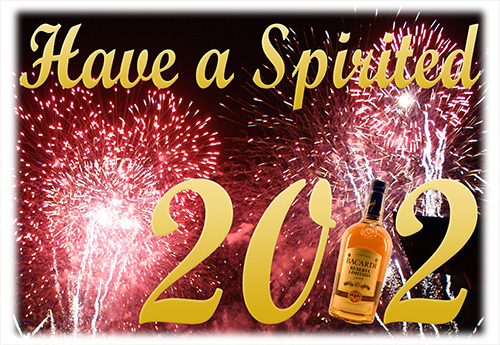 Here’s to a great 2012 – Salute!